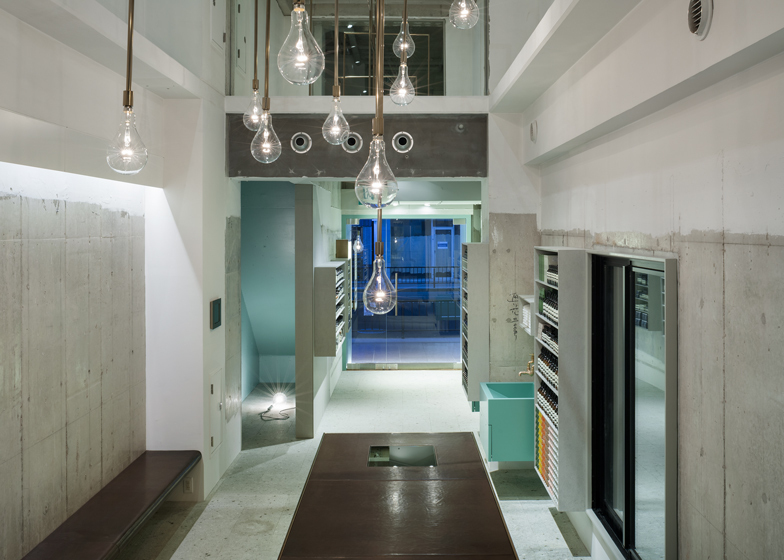 Metal pipes and lightbulbs previously used on squid fishing boats are used to make a sculptural light that hangs from a double-height space in the centre of this Aesop skincare store in Kyoto (+ slideshow). 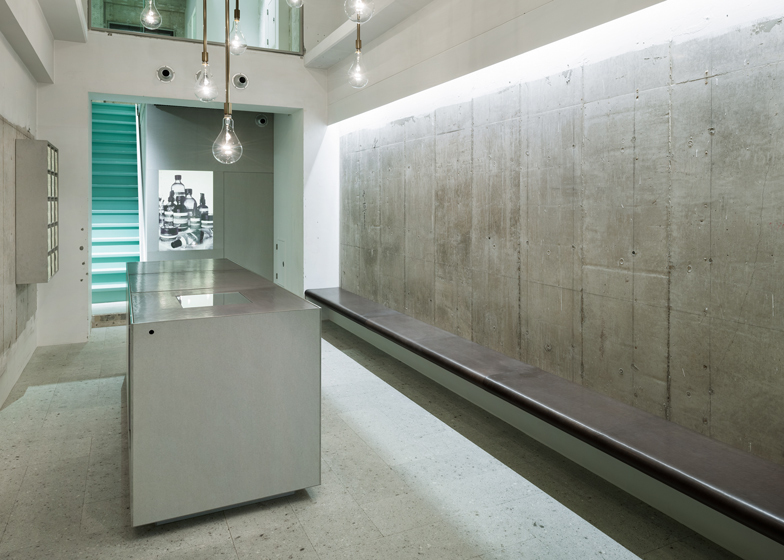 The refurbished interior by Torafu Architects for Australian brand Aesop reuses lightbulbs originally utilised at sea to attract squid. "By utilising the height of the vaulted ceiling, we hung squid fishing boat pendant lights like a mobile and filled the space with light," said the architects. 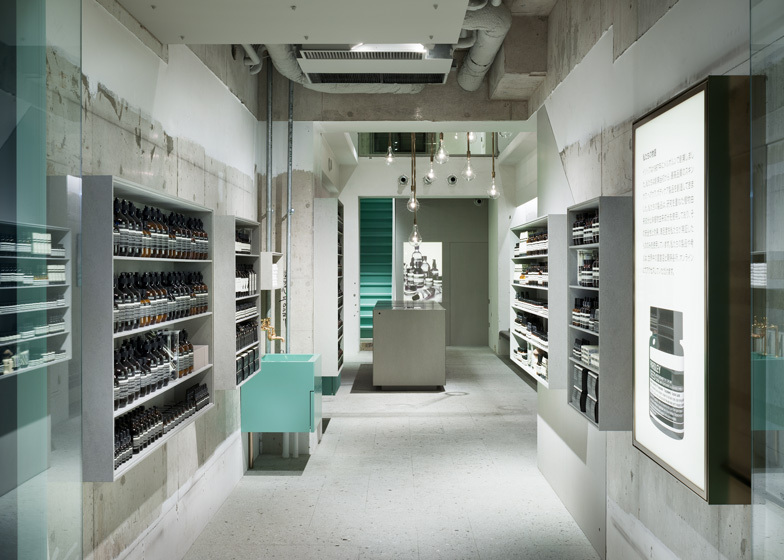 Aesop Kawaramachi comprises a narrow 3.2-metre-wide retail space with exposed concrete walls, roughly covered with white paint along the top and bottom of the ground floor. 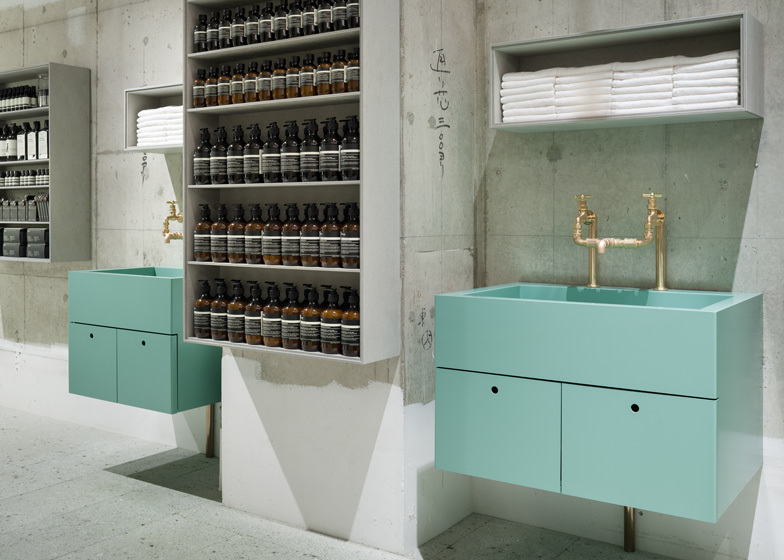 Products are displayed on shelves made from textured grey board that are hung next to turquoise sinks. Alow bench lines the right side of the store and a counter sits in the middle of the space below the cluster of lights. A staircase at the rear leads to a first-floor gallery space, which overlooks the front of the store and the lighting feature. 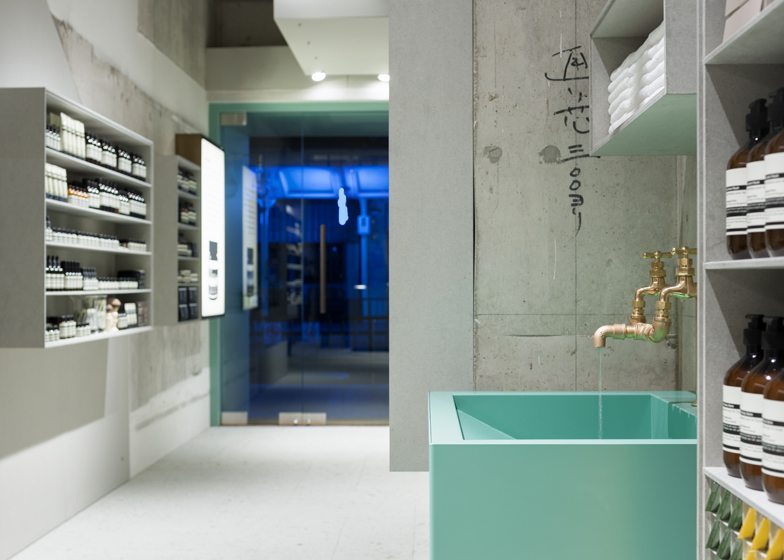 This is the studio's fourth collaboration with Aesop in Japan. 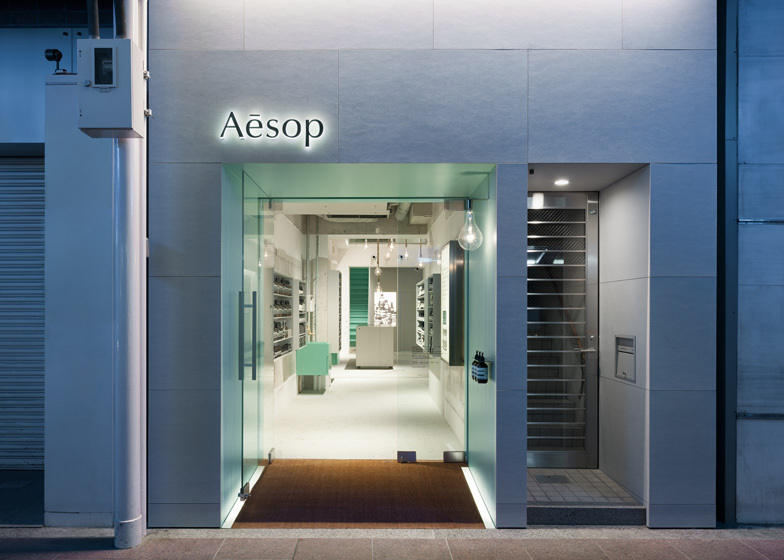 Torafu Architects also designed Aesop Shin-Marunouchi, Aesop Yokohama Bay Quarter and Aesop Shibuya. 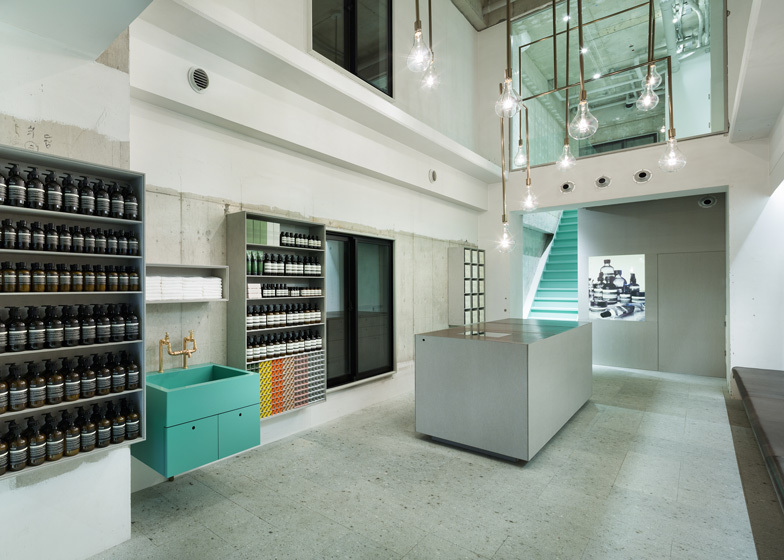 Each Aesop store differs and in an interview with Aesop founder Dennis Paphitis, he told Dezeen that he was "horrified at the thought of a soulless chain". 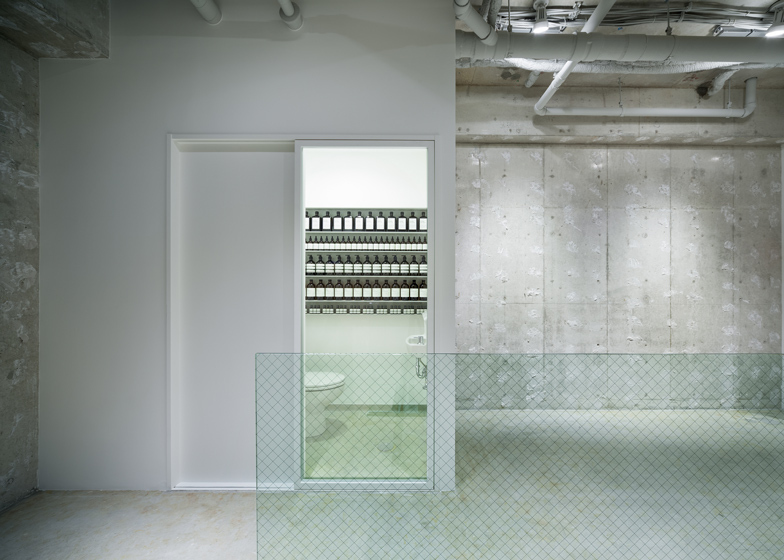 For Australian skin care brand Aesop, we planned the interior and exterior of the new store in Kawaramachi, Kyoto. The store is located on the 1st floor of a building on a busy shopping street. A narrow 3.2m width, 19.7m depth with a spatial height of 6.2m vaulted ceiling. We approached the project by making the most out of the original building structure with the addition of careful alteration. We brought functional part of the store compactly to the narrow space by the entrance, the back space will be a hospitality area consisting of sizeable counter and long bench, where customer can relax. By utilising the height of the vaulted ceiling, we hung squid fishing boat pendant lights like a mobile and filled the space with light. As you go upstairs, you will find the 2nd floor as a gallery space, providing opportunity for customers to meet new people. Flexible board, used for the product shelf is made unburnable and has texture of mortar, taking advantage of its original unique feature. 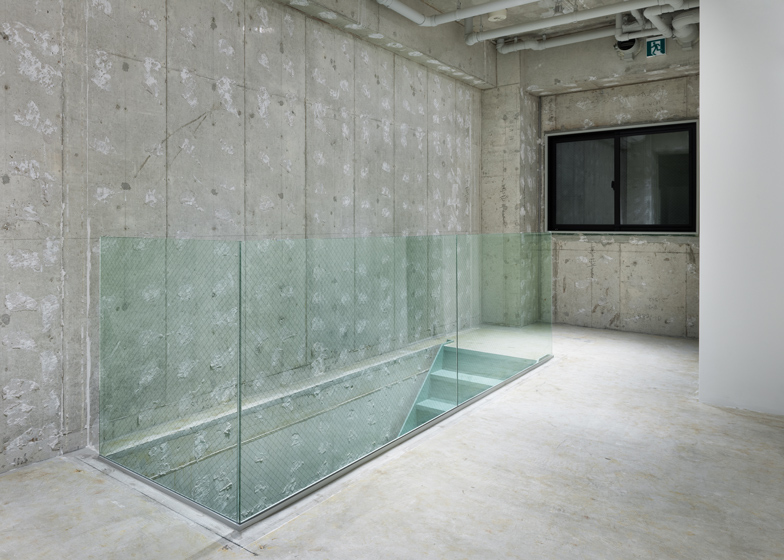 Together with the porous Ōya stone used for flooring, it provides a soft, natural palette that lends a pervasive sense of calm from the moment of entry. For the façade, we covered entirely with flexible board, using interior elements, such as accent green colour and squid fishing boat lamp, in order for people to realise continuity in space, letting the store stand out even in the colourful shopping street. Due to the location on the busy street where many travellers and locals come by, our store design is aimed to blend as part of new Kyoto culture by providing casual yet cosy store space.